Prōject offers a wide variety of training services. Normally a precursor to the training needs assessment, this service module examines the strategy of the business and its key goals and objectives. This ensures that the training events and communication plans are fit for purpose. The assessment determines the training requirements for each eligible audience (e.g. executive, technical or end user) and the most suitable training method. We go beyond a traditional skills gap analysis to create an effective communication plan that will support your change management programme. Depending on the extent of your project, the duration of a training needs assessment could range from three to 25 days. Informed by the training needs assessment, training design sets out your training schedule, defines course content, fits courses to audiences and establishes the training method. The delivered outcome is a portfolio of training course synopses with clearly defined course aims and objectives. The development of course content, including student training materials, instructor materials and workshop structures, can be carried out by our consultants, your training teams or a combination of both. Our training centre in Hemel Hempstead has been designed and purpose-built to offer best possible learning experience. 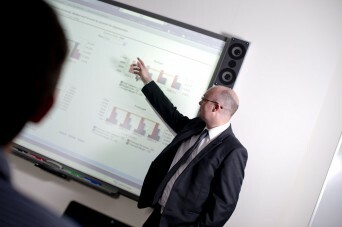 Facilities include the latest training equipment with interactive whiteboards. Innovative desks which incorporate computer and flat screen monitors, can simply be lowered into the unit when not needed. Trainees can log into training environments using VPN and high speed internet connection.